I was tired today. When I saw a campground near the beach, I decided to stop for the day. I hadn’t gone swimming in Spain yet. the Costa Brava has nothing on this! 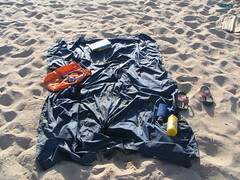 Well, it took me a little less than 2 months to realize that my tarp for my tent could make a good beach towel. 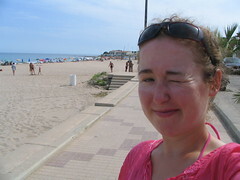 It worked much better than using the clothes I wore to the beach. Every day my life becomes more luxurious here. 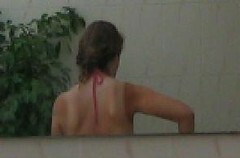 aaahhh check out these tan lines! oh, and that factory? I asked someone what it was and it was a nuclear plant! The campground was practically full, mostly of French tourists. 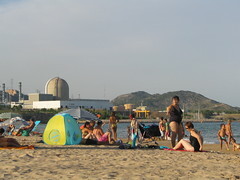 I do not understand why anyone would choose to vacation next to a nuclear plant, especially when there is so much great stuff to see in France.